By the time the latest business trend evolves into a job title you can find on thousands of LinkedIn profiles, you’ve already fallen behind. The trend-turned-must-have of the moment? Sales enablement. 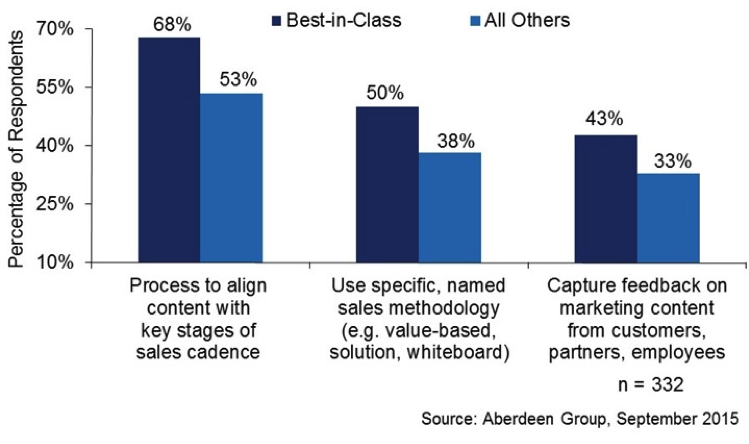 A new research report from Aberdeen Group explores why sales enablement has evolved from a nice-to-have position into an essential tool for successful B2B selling. 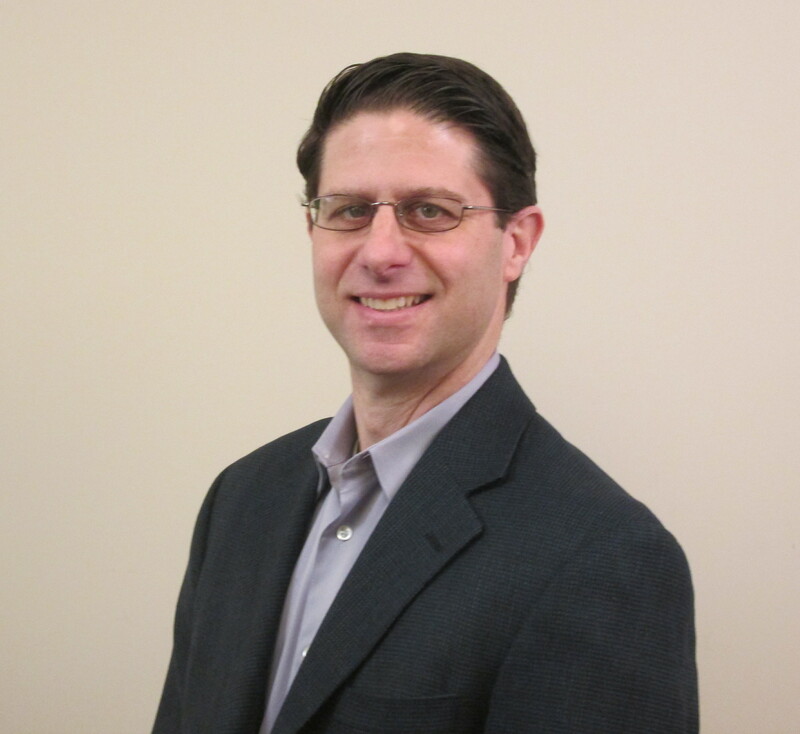 It’s hard to overemphasize the measurable business value of Best-in-Class sales results. There doesn't exist a single Sales SVP who wouldn't like to show their CEO dramatically better same-year quota results, either on a team-wide basis or proportion of reps who achieve quota. And in terms of annualized performance change, no one wants to be "that guy" who delivers Laggard-like reductions in revenue attainment, or growth-killing expansions of the average sales cycle. Nevertheless, 80% of survey respondents failed to meet Best-in-Class performance standards, and it is this audience who can benefit the most from Aberdeen’s ongoing research findings. 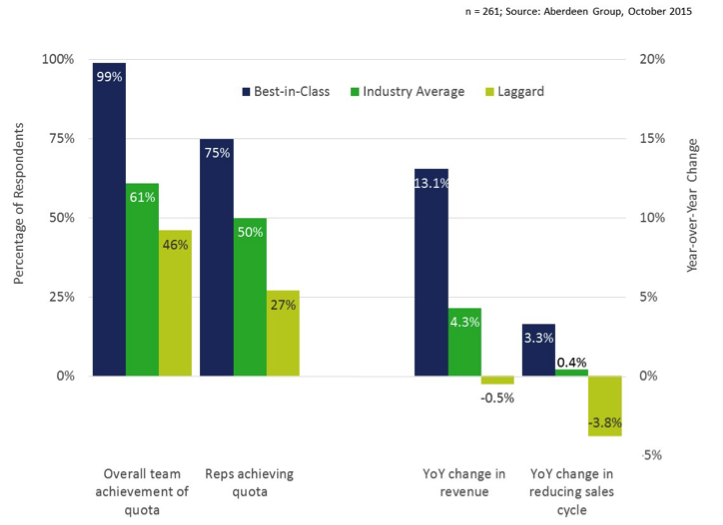 Our research surfaced clear trends that provide insight into how Best-in-Class companies achieve their numbers. 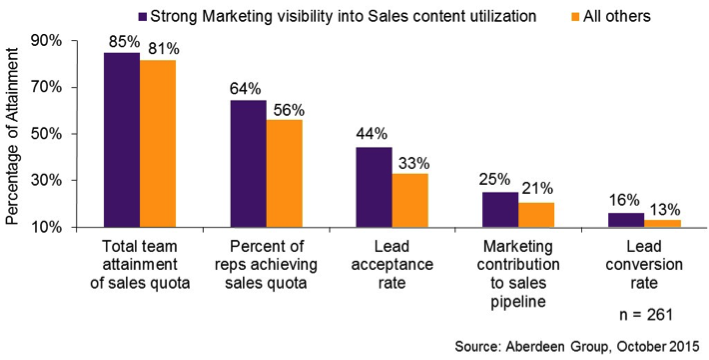 One striking result is the differential between Best-in-Class sales teams, who indicated “Marketing has extensive visibility into the sales team’s utilization of content / assets” at a higher rate than Industry-Average and Laggard organizations. Sixty percent of Best-in-Class companies reported formal sales and marketing alignment processes, while only half that number — 31% of Industry Average and 28% of Laggard firms — had the same sales enablement practices in place. These data points reflect a gap that still exists between marketers and sellers. While the vast majority of the former utilize marketing automation software to track the effectiveness of their content, only 35% of the sales audience does the same. If marketers have the technology and processes in place to understand what happens with their messaging, why shouldn't sales teams enjoy the same visibility? The lesson here: Take the time to acquire and deploy a specific methodology to formally track how your sales reps and channel partners use marketing content. Not only will you be able to correlate this intelligence with your Marketing efforts, you'll refine the connection between Marketing collateral and the checks your customers write to your company. When asked what tactics they’ve used to improve their sales performance over the long-term, Best-in-Class companies’ top three responses are: “Improve differentiation in messaging to tell a better, unique story personalized for each prospect/customer” (61%), “Better align content to buyers and journey stages” (46%), and “Tightly align marketing activity to specific sales objectives” (44%). In Figure 3, we explore three practices Best-in-Class companies follow -- on average -- 30% more frequently than under-performing firms. These results yield three lessons for sales leaders. 1) Align Marketing content with stages of the buyer’s journey. The traditional "sales cycle" has taken a backseat to a data-driven "buyer's journey." B2B enterprises must adapt to the dramatic shift that in the balance of power between buyers and sellers. As we outlined in our report Customer Engagement Has Evolved. Can Your Sales Team Keep Up?, businesses must acknowledge that their prospects and customers can discover and understand all of the behind-the-scenes details – pricing, features, benefits, etc. – at work in purchase decisions without a salesperson’s help. Unevolved enterprises fail to close more deals. But when Marketing and Sales align content with key stages of the buyer’s journey, they are more likely to win business. By personalizing their messaging for savvy buyers who ignore generic, one-size-fits-all mass communications, they are able to get in front of the right buyer, stay in front of them throughout their journey, and win. 2) Develop and implement a formal sales methodology. We also know from Aberdeen's extensive sales training research that utilizing formal sales methodologies has a huge impact on successful, large-scale enterprise selling. At first glance, this process might seem to contradict the theme of personalization. Is it truly wise to deploy a broad and consistent messaging strategy? Don't each of our markets, verticals, and personas deserve their own unique sales pitch? Of course they do, but it is only with Marketing’s help that sales can continually develop and measure different messaging strategies. In turn, these tactics are best deployed in a measurable way. This is only possible through an agreed-upon methodology that both departments support and collectively deploy via content performance analytics. 3) Collect feedback on Marketing content from all stakeholders. Best-in-Class companies are 30% more likely than under-performers (43% vs. 33%) to capture feedback on marketing content from all possible stakeholders. Modern corporate marketers cannot survive without measuring in great detail the links between their output and their results. They should also understand which messages influence which purchases and the extent to which salespeople are comfortable sharing Marketing content with prospects. This feedback can be collected through anecdotal communication, and with formal "tribal knowledge" capabilities embedded in the best sales enablement platforms. These applications often include an element of enterprise social collaboration that gathers user ratings and comments, which indicate how the marketing team’s many stakeholders react to their content. It’s not about what we create that matters -- it’s about what our internal and external customers consume.